British Airways has been touting improvements in the World Traveller Plus ‘soft product’ (food, bedding etc) for some time. I’ve now managed to get hold of some information on what is coming as well as some not-seen-elsewhere promotional images of the new meal service. The changes will come in two phases. The first phase, starting on 1st February, involves the new food options. The second phase later in the Spring will involve new soft furnishings and a brand new amenity kit. There will be three main courses to choose from, including one vegetarian option. The starter and dessert will be improved and will no longer be taken from the Economy / World Traveller meal. This puts BA on a par with Virgin Atlantic which serves a totally different meal in Premium. Both the main meal and the second meal will be served on china and with ‘real’ glasses. At present only the main meal uses glass. The image below is a typical ‘second meal’ for a longer flight. Hot food will now be guaranteed for the first time, instead of the pre-packed sandwiches often provided at present. On shorter flights it will be a hot hand-held snack and on longer flights you will get a hot meal tray, with a choice of two options, such as the one pictured below. I need to confess that I have never flown Premium Economy on British Airways, Virgin Atlantic or Norwegian so I am not sure how this compares to what the competition offers. It certainly appears to be a major improvement on what BA is offering at present. 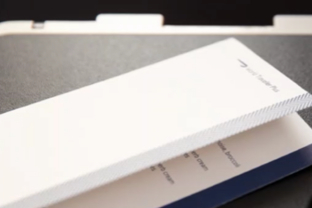 Regular HFP readers will know that British Airways is rolling out a new World Traveller Plus seat. It is currently being installed on the Boeing 777-200 fleet, initially on the Gatwick aircraft. This is the smart-looking seat you can see in the photo above. 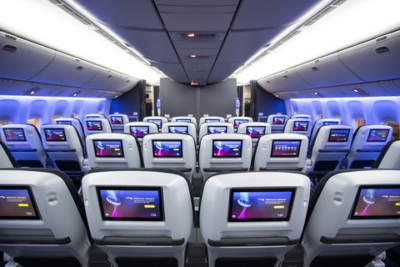 You will also find a version of the ‘larger TV’ seat on the A380, Boeing 787 and Boeing 777-300ER fleets, but not all of the Boeing 747 fleet. These ‘soft product’ changes do not fully close the gap with Virgin Premium, however. We did a comparison last year of British Airways World Traveller Plus vs Virgin Atlantic Premium, which you can find here. In almost all respects, the Virgin Atlantic product is better. Norwegian also offers an impressive Premium service which we reviewed here, although Norwegian is no longer offering lounge access on Premium Economy tickets unless you buy a flexible one. In my view, the best reason to book World Traveller Plus is to upgrade it to a flat-bed Club World seat using Avios. The cost to upgrade is the difference between a Club World and World Traveller Plus ‘100% Avios’ redemption plus any additional taxes. New York, peak dates, is 120,000 Avios for a Club World return flight and 80,000 Avios for World Traveller Plus. An upgrade from WTP is therefore 40,000 Avios return or 20,000 Avios one-way. This is excellent value. That’s not what the article says. It says “you will also find a version of” the seat on the other planes – not the same (new) seat. The two photos show the new seat and then the old new seat, not both the new seat. Literally flying out of Heathrow on BA in WTP on Feb 1st. Will let you guys know this new offering is if I get to experience it! I found Rob’s article confusing as well. Actually it sounds like the new seats on the LGW 777s are an improvement on the seats on the 787, and the leg rests are back. They are an improvement, I was trying to differentiate between ‘big TV’ and ‘small TV’ seats though which confused it, because some planes have the big TVs but an older seat version. The best PE i’ve flown on is Japan Airlines. The seat is a shell seat with a hard back around it (a bit like a non-bed version of a club world seat). Nobody ever reclines into your space and nobody can grab the back of your seat to use it as a grab hold (very nice when you’re asleep) or tap furiously on the touchscreen keeping you awake for a 10 hour day flight when you want a bit of a kip. As JAL is one of only two airlines to have the recommended config of 2-4-2 in economy on the 787 (along with a few original ANA planes), I would expect their PE to be something special. This is a very useful piece of information about Japan Airlines. BA’s WTP is comfortable as long as the passengers in front of you don’t recline their seats. As you can’t be sure of availability of the front row seats when booking, you should be aware that you may have a claustrophobic journey. One of the advantages of using American Airlines is that their website shows seat availability before confirming booking. If only BA would offer passengers this information. VS also show availability before booking, which can be handy. Of course, offering “free” seat selection is also good. BA show seat availability before confirming booking, but during the booking process. But they charge for seat selection, unless you have status or are travelling in F.
AA show seat availability during the booking process, but helpfully do this before selecting a specific flight. Last time I checked, seat selection was free at the time of booking (usual supplements for exits, extra leg room etc). I always check seat availability and aircraft type before committing to a specific flight. I think the last (8th) picture of seats with moveable armrests is the new 3-4-3 economy seats, not the new PE seats. In PE, the tray tables are in the seat arms. OK, I give up 🙂 2nd picture removed entirely. Looks like they might also have an improved WT+ seat on some 787s? I’m also thoroughly confused now. My last post can’t be a 787 as it has window blinds, although the picture was linked to Nashville? Who knows. I don’t think that last picture is WTP; looks like WT to me too. In the background, across the aisle, there are 3 seats; 1 with a solid back, 2 with TVs. That would make the configuration 3-4-3, at least forward of that row, which isn’t WTP. I’m a regular user of both BA and VS PE. IME the VS seat is much wider and feels a lot like the old first class on American carriers. BA had the chance to raise the bar when the 787s arrived and IMO still fail to compete with the VS offering. Virgin wins hands down in almost every aspect of PE for us, save for the smaller tv screen. Apart from 64k in CW on the jumbo, our favourite seats are 24H/K in the bubble on VS. Will be a sad day when the 747s leave the fleet. I agree. Closest thing to a private jet the PE upstairs, wide aisle and cubby by the window do make it feel spacious. I believe VS are bringing out a new PE seat on the 350s. Often we take 19A/C on the westbound to get off first but have always found it just as pleasurable! Sounds good be interesting to hear if it’s actually delivered! I booked WT+ via Amex Travel to get the Amex offer, so cannot upgrade in theory. Has anyone managed to upgrade using Avios by phoning BA or at the airport, ie last minute availability? T class is an upgradable fare. Interested in this too, anyone know the valid WTP fare codes for airport upgrade? This happened to me a few weeks ago. They sold me an unpublished fare at the same price as BA and only when I called BA did they tell me what happened. Called Amex and the lady knew what I Was talking about immediately and put me on hold and then told me to pay £1 extra to convert it into a published fare. Couple hours later ticket was reissued and BA was able to process the upgrade. Ahh thanks, it was your case I was remembering – I just couldn’t remember the precise details! O/T I don’t know if this has been covered but Virgin have a newish promotion with Avis, 1000 flying club miles per day plus the base 1000 for a 7 day rental. The reservation period is 9th – 31st January 2019. The rental period is 1st February – 31st May 2019. Good to see Rob covering it. Due to a tight corporate travel policy I tend to spend a lot of time in WT+. Improved meal service (although the current is not actually that bad) is welcome as well as an improved bedding and amenities pack both of which are very poor and I hold onto my CW set for dear life. But VS and CX have wider seats which in all honesty is why i fly Prem Economy. Why do airlines, particularly BA, serve Bocconcini with every salad. It’s truly evil stuff. It depends on the Bocconcini. Fresh ones eaten where made can be lovely. The ones British Airways and other airlines probably buy in are likely to be made by a firm whose name begins with G. that makes any mozzarella-type cheese taste like chewy plastic. Why are you leading this story as exclusive pictures, there were pics on twitter and BA Flyertalk yesterday Jan 16. I also thought that VS have removed dedicated crew from BA, whilst BA now have dedicated PE crew on reconfigured aircraft. Er …. not these pictures. No-one has these pictures, inc breakfast and the curry. Isn’t an exclusive where it’s only you publishing. Other outlets published this before you. It doesn’t say the article is exclusive. The headline says the PICTURES are exclusive, which they are. I still haven’t seen any other shots of the curry or the breakfast anywhere.